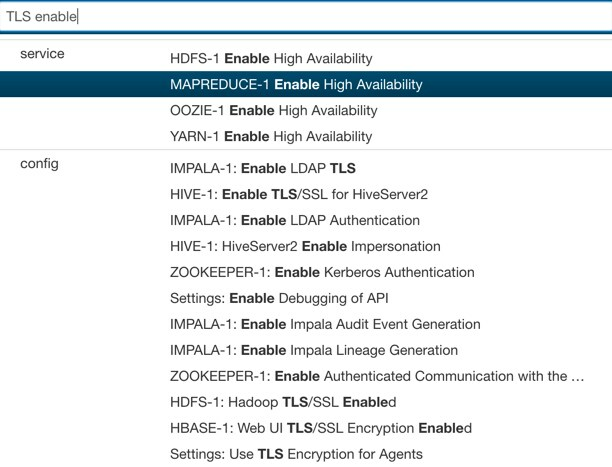 Use Cloudera Manager to verify security mechanisms for your cluster by simply examining the properties for the cluster. This shows at a glance that both Kerberos and HDFS transparent encryption have been configured for this cluster. Select Settings from the Administration drop-down selector to open a search field. Enter TLS in the search field to display all TLS related configuration settings. See How to Configure TLS Encryption for Cloudera Manager for complete information about configuring TLS for the cluster. To find all TLS settings, cluster-wide, enter "TLS enabled" (or simply, "TLS") in the top-most search field on the Cloudera Manager Admin Console. Then you can easily select from among the display list to examine the actual setting.